A long campaigned for walking and cycling amendment has been added to the Infrastructure Bill. In a significant step toward safer cycling, if adopted, the proposals will see the Government obliged to lay out its investment in cycling and walking in line with how the roads and railways are funded. The amendment doesn’t, at present, commit to funds or design standards, though will see civil engineers have to give strong consideration to cycling and walking when planning infrastructure. With this commitment, design standards will now be under the microscope more than ever. There is a fear among cycling advocates that money could still be spent on more poor infrastructure. “Transforming the way Britain travels is not something we can do overnight but this amendment represents a massive shift in thinking and most importantly, commitment. It brings us one step closer to realising our vision for a cycling nation. “If passed, this Bill will mean that cycling can no longer be ignored as a legitimate form of transport. It makes the transport secretary directly responsible for setting targets and putting in investment. The news comes on the back of a report that suggests increased levels of cycling has the potential to generate £248 Billion for the economy. The public backs such investment too, according to a YouGov poll. 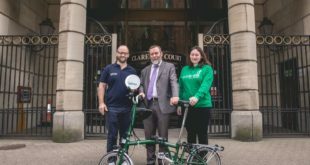 “I am really delighted that the government has seen the force of our argument and is writing into law the cycling and walking investment strategy. “It is the right thing to improve health, the environment and congestion. “This is a massive step towards creating that “cycling revolution” the Prime Minister promised us two years ago. Thanks to the hard work of DfT officials, the All Party Cycling Group coalition partners and the thousands of supporters who have written to their MPs cycling in England looks to have a future. The cycling and walking investment strategy coalition of organisations includes British Cycling, Campaign for Better Transport, Campaign to Protect Rural England, CTC: the National Cycling Charity, Living Streets, Sustrans, the Chartered Institute of Logistics and Transport and the Richmond Group (British Heart Foundation, Asthma UK, British Lung Foundation, Age UK, Breakthrough Breast Cancer, Diabetes UK, The Neurological Alliance, Macmillan Cancer Support, Stroke Association and Rethink Mental Illness).